Next Monday I'll be enjoying myself at a Gift Swap with a serious purpose. Along with cakes, biscuits, sweets and jams, we'll be exchanging baking tips and experiences of using that most heady of spices, vanilla. It will be a social occasion but there's a serious point to our get-together. We won't all know each other but we will all have something in common, beside an interest in cooking. We've all been moved by the lives of the vanilla growers of Uganda and this is a chance to get involved and try to help raise their profile. Three week's ago I listened to a Radio 4 Food & Drink Programme on vanilla. Writer and broadcaster Vanessa Kimbell painted a vivid audio picture of her walk from field to production plant on a plantation in Western Uganda. The name of the estate, Ndali, was familiar to me. In fact I had some of their Fair Trade vanilla pods in my store cupboard. After listening to the programme I went on-line to learn a little more of the difficulties the small farmers on neighbouring estates faced in growing vanilla. If you heard the programme, or read Vanessa Kimbell's blog you couldn't fail to be moved by one farmer's dignified statement "We don't want charity, we just want a fair price for what we have grown"
Demand for vanilla far outstrips the supply of vanilla beans and most vanilla flavouring used in the UK is synthetic, the vast majority of it going into manufactured foods. For home baking, thankfully, we can avoid this 'vanilla essence' and buy pure vanilla in pods, extract and powder form. It's more expensive of course but then you don't get those notes of dates, honey and butterscotch in synthetic vanilla or lesser grades of natural vanilla. Next time you shop for vanilla to flavour that custard tart or plum compote, spare a thought for the Ugandan vanilla growers and pay a fair price. 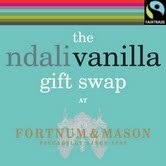 Our Gift Swap, organised by Vanessa Kimbell, is taking place at Fortnum & Mason who have been kind enough to host the gathering. So what to bake? Well there's a long list of foods which pair beautifully with vanilla - sweet and savoury - so there's no difficulty there. I haven't yet decided what I will make. I just want it to be something which does justice to the effort that has gone into producing Ndali Fair Trade vanilla.